Diving With Arab Divers In The Red Sea - Riot, Riot! The first thing you notice when arriving at South Beach Aqaba’s premier dive shop is the beautiful tiling that adorns the place. Arab Divers is a well run PADI operation that employs a mix of locals and foreigners. After having seen women in Burkas for ten days it’s almost strange to be surrounded by bikini clad ladies with strong tans. Strange, but also liberating. I get to finally wear the board shorts and beachy tops I brought on this trip. At least on the property and by the pool. The atmosphere is super relaxed. You can do up to three dives a day. Two morning shore dives and if you still feel like it after lunch a third one is possible. Which dives you want to do you can decide shortly before departure. As always I was stoked to get back under water and planned initially to do the maximum of three dives each day. However, after the initial morning dive, I was quick to change my mind. A Red Sea water temperature of only 24°C is a little too cold for me. Nothing worse for me than to get out of the water shivering, as was the case here. All of these are shore dives and both the first two and latter two share entry points. Maximum depths are around 25meters and our dive time varied from 50 minutes to one hour. The coral is alive and well and we saw plenty of reef fish and even a few nudibranchs. All relatively small in size and quantity when comparing to the abundant waters of Thailand or the Philippines. Nonetheless nice dives. Our group each time was around 4 divers with a divemaster. Our group was very experienced, advanced open water divers with around 90 dives like myself and then rescue diver certified and divemaster level. This made for a relaxed and lasting dive experience. The divemasters who were leading our dives were very experienced themselves. Obada, for example, has been leading over 5.000 dives since 1998, with an excursion to dive in Egypt, but mostly right there in the waters of South Beach Aqaba. Unfortunately one of the most lasting memories of these dives is the amount of trash found underwater. Plastic bags, plastic bottles, cans, candy wrappers, plastic cups and plates: each time all of us collected as much as would fit into our BCD pockets and additional filled plastic bags. It’s heartbreaking to see this level of trash. Not only under water, but also at the beach. South Beach is packed with Jordanian families spending their day out on the beach. Women in Burkinis or just their regular full on coverage and kids in colorful swimsuits. Everyone is smoking away and leaves a lot of trash behind. These leftovers naturally find their way into the waters and beckon to be collected again. If you’re looking to spend a nice time on the beach I do not recommend Jordan. It’s rocky, dirty and crowded and women in bikinis do not exist. Should you be brave enough to pull it off, you need to be comfortable with stares and whistles. Overall we had a great time. Should you travel with Lonely Planet advice: Arab Divers don’t actually sell beer but it’s OK to bring your own and drink it. Spectacular sunsets each night make for the perfect backdrop to enjoy a cold drink and swap dive stories. Although alcohol is scarce, there are places to find it. The easiest way to buy some is at the Tala Bay resort’s liquor store or mini market right down the road. Aqaba is likely your furthest stop south in Jordan. From Arab Divers’ roof terrace you can see all 3 neighboring countries: Saudi Arabia in the south, Egypt straight across on the other side of the Red Sea and Israel to the North. 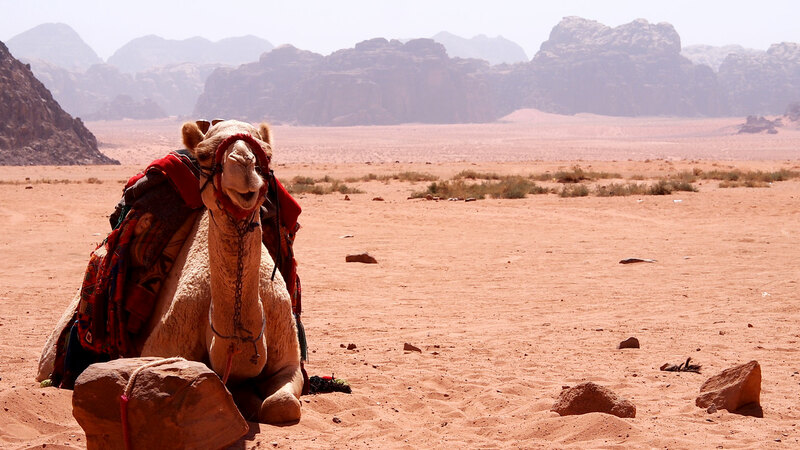 Overall an enriching experience to include into your Jordan itinerary. Read also about the Dead Sea, Jerash, and the desert Wadi Rum.